Have you ever wondered what embroidery is all about? It is the art of decorating cloth! What do all of us sewers have in common? We like to create things with cloth, so let’s take your sewing projects to the next level with machine embellishment! Join us on a journey through all different stages of machine embellishment. We will reveal the information you need to know so you can get the most out of your sewing machine’s decorative stitches. 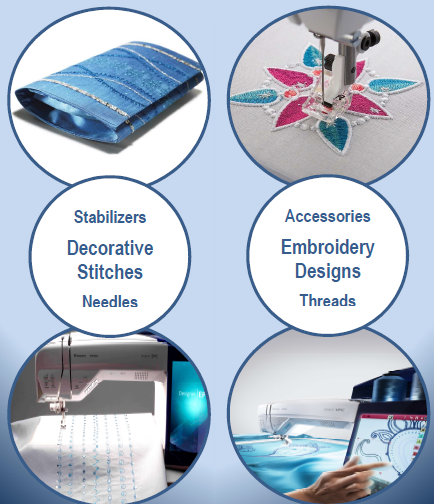 We will also explore free-motion and automatic embroidery techniques from start to finish, covering all the necessary supplies and steps in between. Our HUSQVARNA VIKING® Education Specialist is excited to share various techniques she has learned over the years which will not only inspire you but help take your sewing projects to an entirely new level. Sign up early as space is limited! This is a lecture/demo class!